You know that I hate the word cancer with a passion, this disease has presented itself on both sides of my family, my mother’s and my father’s side, but I did say last week (or was it the week before) that we should talk about the survival rate and aim to keep the subject as positive as possible. 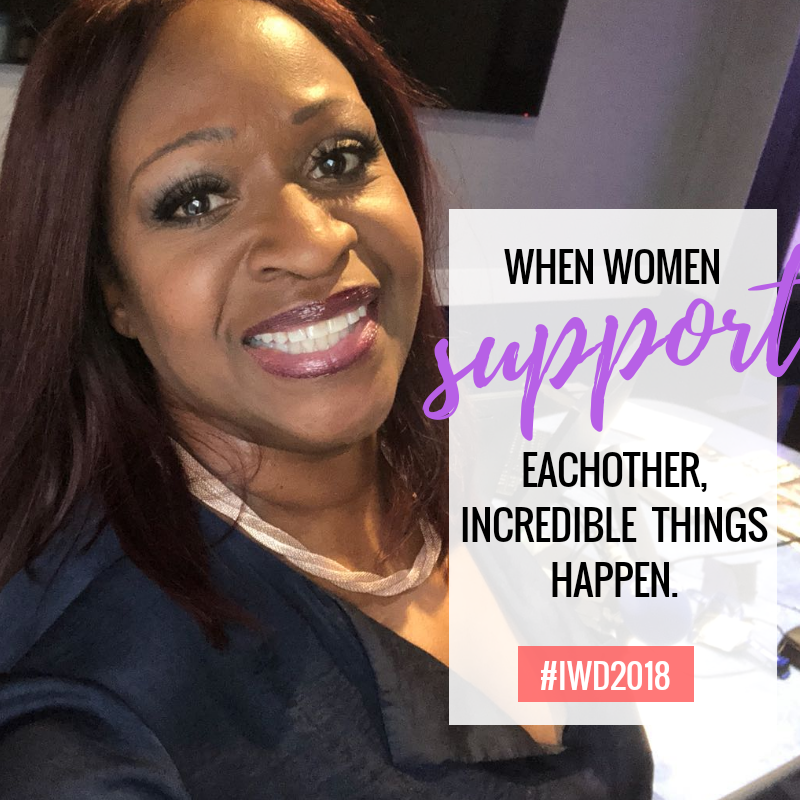 Evadney Campbell MBE has been in the media industry since 1987, when she became the first Black Female presenter on BBC Radio Gloucestershire. In 1994, she was awarded an MBE by the Queen for her services to the African and Caribbean Communities in Gloucestershire following her dedication to charity work over a number of years. 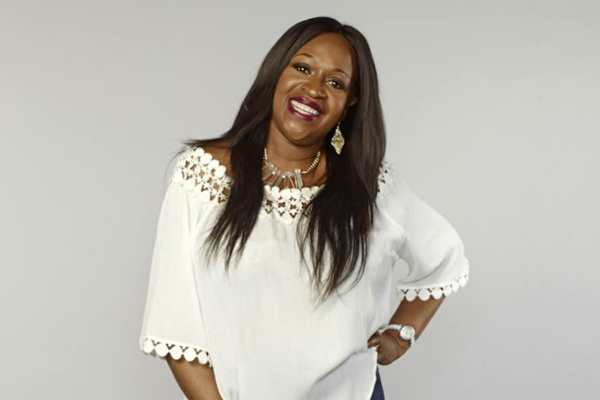 After gaining a Post Graduate Diploma in Broadcast Journalism, Evadney joined BBC Radio Bristol as a Broadcast Journalist, before moving in 2001 to work for BBC London where she took on a variety of roles including news on both radio and TV. In 2012 after over 25 yrs working in the media, Evadney and her daughter Karen launched Shiloh PR and media training agency. Evadney is also a qualified trainer having gained a PTLLS Level 4 training qualification from City Lit in London. 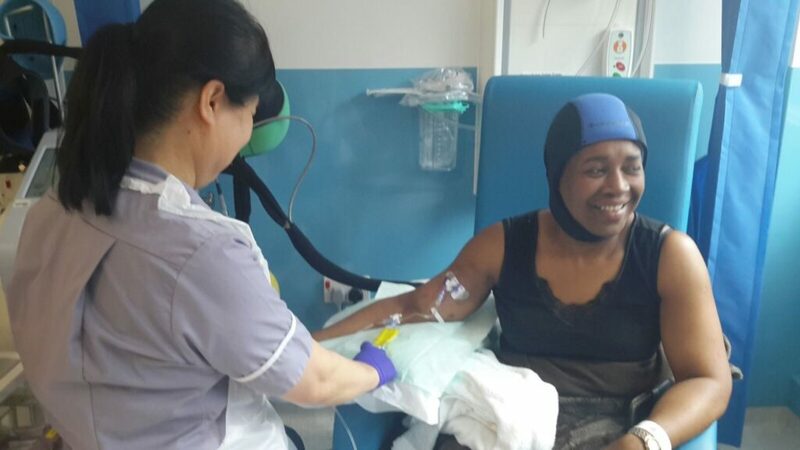 Last year I wrote this blog detailing my journey through breast cancer. As we mark breast cancer month, and I’m faced with the untimely death of a number of friends, non of whom were battling any known illness, I’m forced to take another look at where I’ve been so, here is the blog as written all those months ago. Today marks the end of a long, emotionally stressful eight months’ journey. The day after my birthday in January 2017, I went for a routine examination which changed my life forever. Two weeks later, my positive mental attitude, which I had been cultivating for several months earlier, really was my saviour. Within a month of that ‘routine’ examination, I was being told I had breast cancer. The ‘Big C’ – Wow! Strangely enough, as I’m sure many people who’ve been through this will tell you, the confirmation was a mere formality. After the second screening, ultrasound and biopsy, you already know the worse. Still to have it said out loud by an oncologist and with a Macmillan nurse present (they are phenomenal by the way, more on them later) kind of make it real. Being on my own when I heard the devastating news, I didn’t want to ‘show myself up’ by crying so, as is my norm, I said thanks, reassured the nurse and oncologist that I’m fine and call (accidentally) my daughter. My intention was to simply text her to say it was not good news and we would talk later but, instead of pressing the text icon, I pressed the little telephone icon. I certainly couldn’t just hang up – she knew I was having my result so would have called back. Not wanting her to be too upset, she was at work, I played it down and reassured her I’m fine. Six weeks later, I’m at St George’s hospital with one of my best friends, who’ve been my rock, for my operation. We arrived at the hospital at 0700am and laughed throughout my waiting, right up to being wheeled down to the operating theatre. My theatre nurse said I’m the first person she’d bought to this point that was still laughing. Two months after the operation, my real challenging journey began. Twelve weeks of chemo, followed by four weeks of radiotherapy ended this morning. (7 Aug 2017) though I still have months of Herceptin injections to go, I now feel that the worse is over. My Chemo journey began on 3 April, being the ‘lady’ I am, I was not particularly worried about the treatment. I was more concerned about losing my hair, so I opted for the ‘cold cap’ treatment and ‘by jove’ was it cold. The first time when the cap was removed, I had visible icicles on what little hair I had. This is the head nurse in the cancer day unit at St George’s. She along with all her team were just phenomenal. There is nothing like the NHS. I cannot fault my treatment and, if you’ll excuse me for being a little political, without immigration the NHS would crumble. Throughout my treatment, the vast majority of staff with whom I came into contact, have hailed from all over the world. We’re so privileged to have these amazing people, so don’t believe all those who moan about immigration, these people give far more than they take. This is the most I’ve ever had to rely on the NHS but, listening to some of the rhetoric around immigrants, I couldn’t help but think about those who came from the Caribbean in the late 40s early 50s etc to work in the NHS, and how their contributions have led to the wonderful service we now take for granted. Okay, enough of my soap box. Before I return to my journey, in brief, earlier I mentioned the Macmillan nurses who’re there with you from the word go; they are the best. They’ve helped me navigate not only my treatment but our complex and stressful benefits system. They’re there for all sorts of advice including dietary. There are so much I could say about some of the side-effects, my worst being losing my taste buds but, maybe that will be in another blog. Back to my journey, I’ve survived breast cancer, and have come through the other end relatively unscathed. I’ve remained positive, I continue to be thankful daily for my blessings and, there have been many. I’ve continued to work as far as possible and truly hope for those who’ve seen me during these months but had no idea what I was dealing with, I’ve been an inspiration. Maybe now, they too will realise that you can continue living life to the fullest when you’re facing life-changing challenges. As the latest Cancer ad say, “A person with cancer is still a person” – or something to that effect. I can’t thank all the people who’ve been a tower of strength to me throughout this most challenging of times enough. People, whom in the past I would never have thought of as ‘friends’ have been more supportive than many of those who I called friends. It’s true what they say that “you find out who your true friends are during difficulties”, or something along those lines. It’s very true. I’ve been blessed with some amazing angels who’ve held my hands and carried me to and from hospital for months, not to mention giving advice and encouragement. This was me two weeks before the end of my radiation treatment. As you can see, despite enduring months of that incredibly cold cap, I didn’t entirely save my hair. It’s now very wispy and certainly greyer than I like, hence I’m having fun creating exciting head wraps. For those who’ve read my previous blogs, or anyone who knows me personally. You will know, I always have a positive point to everything. On this occasion, it is to say, being diagnosed with the ‘Big C’ or dare I say it, other life-changing diseases, does not have to mean you put your life on hold. Stay positive, limit the time you spend with negative people and filter all the ‘good’ advice you will be flooded with. There are so much more I could go into about this journey however, let’s leave it for now. One day I may have the courage and strength to tell it all, warts and all. For now, it’s suffice to say, my faith has seen me through this, but for you, use whatever props you have which will keep you positive and look forward to the future. 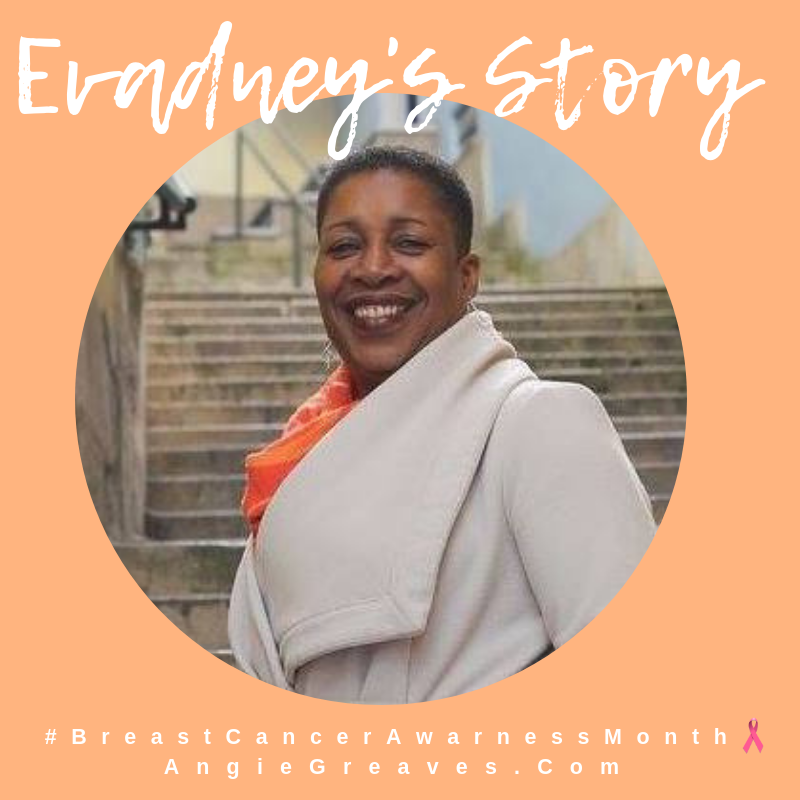 I’m so thankful I revisited this blog at this poignant time – October, breast cancer awareness month. It’s strange how quickly you forget – maybe it’s the brain’s way of protecting us but, I have a renewed sense of thankfulness. I have life and I have every intention of living it to the full. Anything less would be being ungrateful. Evadney’s strength, courage and humour humbles me. Throughout all of her story all I could think was “survivor”. To be able to go through what she did and come out on the other end with a smile, having lost none of her zest for life? SO inspiring! Thank you Evadney for sharing a piece of yourself with us. Even if we don’t want to talk about the “C” word… we need to do so. Early detection is the key. Do you have a breast cancer survivor story? When was the last time you got a mammogram? I can tell you the idea of cancer terrifies me so I have to force myself to get them done. This topic is too important to stay silent on… let’s talk about this on Facebook,Twitter, and Instagram! 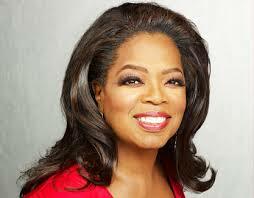 Why I just LOVE Oprah! Skincare products men really want! Thank you so much Angie for sharing my story. Although I wrote it and therefore, have read it several times, each time I read it I cannot help but feel thankful. I truly it is a source of strength and inspiration to anyone faced with this disease or anyone who’s supporting someone going through it.